Medline Yankauers: Our Yankauers Are Designed With Durability And Convenience In Mind. They Are Constructed Of A Clear, Transparent Material With A Slip-Resistant Handle, A Smooth And Uniform Inner Surface For Rapid Evacuation, And A Ribbed Five-In-One Connector For Easy Connection To Various Sizes Of Connecting Tubing. They Are Available In Various Sizes Without Or With Control Vent Bulb Or Flange (Straight) Tip And Rigid Or Flexible Design, For Continuous Or Intermittent Suctioning. 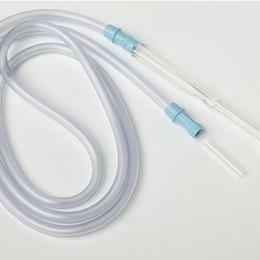 Yankauers With Tubing, Sterile (Bulb-Tip Yankauers, 1/4" Non-Conductive Vinyl Tubing.) With Control Vent 72" Non-Conductive Tubing.